Happy February! How did your first month of 2019 go? Mine wasn’t very eventful… I mostly just got a lot of thing organized in my house that needed to be, and pretty much just tried to stay warm indoors! I did however get some makeup looks done, so if you haven’t seen those yet make sure you check them out on my instagram. Now that February is here i’m feeling refreshed and ready to get started on some videos i’ve had planned. I have a kitchen tour video coming up next week, as well as some unboxing videos. So, stay tuned! 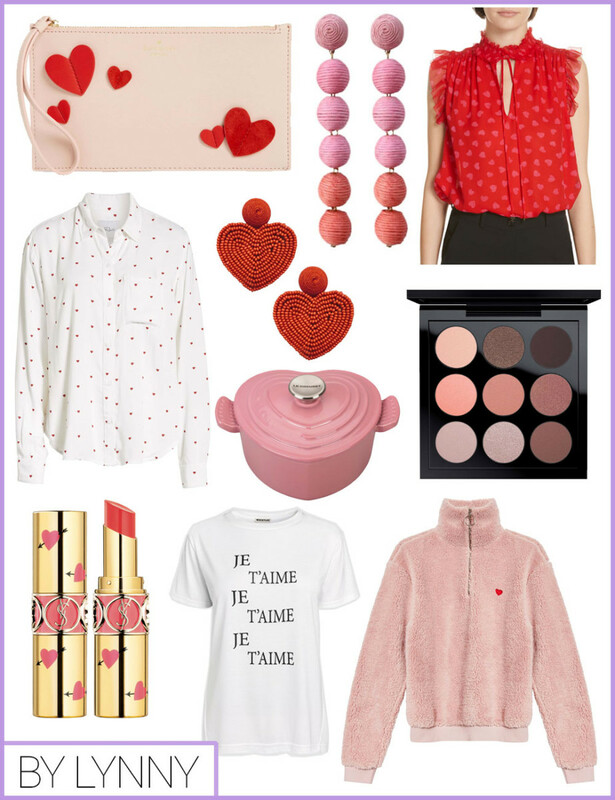 As you know, Valentine’s Day is in 2 weeks and even though I don’t really do much on that day, I still like to find cute, themed items. This heart shaped Le Creuset pot is so cute! It can be displayed on the counter top or stove and it comes in pink, red, and white. I love the style of this red top! I don’t wear sleeveless tops often, but I would definitely consider wearing this one. This tee is much more my everyday style, and looks super comfy! Do you guys do anything for Valentine’s day? This year I decided not to decorate, like I’ve done previous years. Remember my tablescape from two years ago? I may just buy a few pretty pink flowers and thats about it.